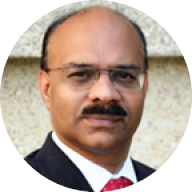 Sriram Bharadwaj (Sri) is Director, Information Systems, University of California, Irvine, Healthcare (UCI Health) and has over 25 years of Information Management Systems experience in multiple industries including healthcare. Sri has held many leadership positions in health plans and prior to his current work at UCI Sri consulted with Integrated Delivery Network (IDNs) around ACO, HIE and Clinical integration. Sri has expertise in Applications Development, Enterprise-wide IT Infrastructure and Operations. Sri is well known for his process knowledge delivering performance improvements in multiple industries during his long tenure with Deloitte in various parts of the Americas, Asia Pacific and EMEA region. Sri also has expertise building products for customers through his earlier involvement with SAP AG (an ERP vendor). Sri is a CPHIMS, PMP, CISSP, Chartered Global Management Accountant (FCGMA)(U.K), Professional, Academy of Healthcare Management (PAHM), and a Six Sigma Black Belt (ASQ). Sri is past committee member for the CIO Healthcare Summits and has delivered many presentations on Healthcare regulations and compliance at various conferences. Sri currently serves as Chair, Privacy and Security Committee, National HIMSS. Sri has been on the Southern California HIMSS Board for many years and also is involved with the HIMSS Interoperability and Standards Workgroup, Patient Engagement Workgroup providing thought leadership and opinion on various matters around patient engagement, interoperability, healthcare legislation, privacy and security.